It was a stormy night. The wind was howling at the window pains and yet the rain hadn't yet begun to fall. It wasn't until the lightning began to streak the cloudy night sky that the rain began to pitter patter at you hospital window. One flash, two, and with the third the lights went out. Well, it wasn't long after that Dr. Frankenstein delivered your little sweetie. She had ten fingers, ten toes, and a crazy white streak in her hair. She was perfect. Well, looking back, you could have guessed that your birth experience was going to be a little different when you got a tour of the OB-GYN facilities. The building was separate from the rest of the hospital, on a winding gravel road on top of a hill. Instead of the hospitals clean tile floors and large sun filled windows these facilities had stone walls and shuttered windows. they had electricity, that's for sure. It was sprouting out of various equipment in the lab. Come to think of it, why did they have a lab instead of a lobby? Oh well, it worked out in the end. And it turns out that Dr. Frankenstein actually has a fabulous bedside manner! 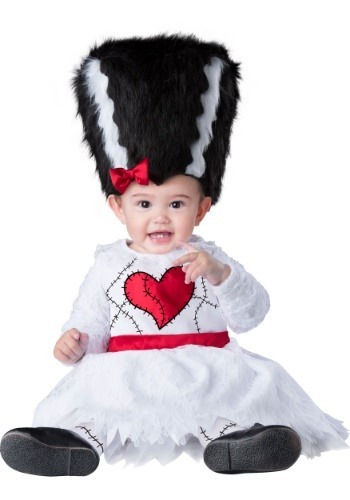 Your little one will look the part of the bride of Frankenstein with this adorable bride monster costume. It features a onesie dress, a dramatic headpiece with the classics stripes of white in the black hair, and a pair of stitches tights. The dress has a large satiny heart and black stitches on the chest. The rest of the white dress has a layered skirt with tatters on the hem and subtle lace that is repeated on the sleeves. Whether you're visiting your local mad scientist or simply trick-or-treating your little one is sure to be frighteningly adorable! It’s a great costume. But the head piece has no string or anything to keep in on the child’s head. I had to sew a chin strap. Otherwise it’s a pretty cute costume.